Hailing from Hawaii, Alanaleilani is a Hapa Haole that knows a thing or two about living on an island -granted, her neighborhood was lacking in both Minotaurs and Harpies. Housing a passion for reading from a young age, that thirst quickly turned to writing. Starting with short stories and quickly progressing to full length novels, she continued to practice her craft until one of her scripts was picked up by a Visual Novel company. After producing three different games with them, she realized she had an idea of her own she wanted to pursue, one that featured people of all races and body types, one with real personalities instead of cardboard cut outs and archetypes. Something that reminded her a bit of home, with a bit more fantasy thrown in there. Alanaleilani hopes you enjoy the adventure Love Mythos takes you on, as it's certainly one from her heart. From Curitiba, Brazil, Roger Pugh has been passionate about programming for twenty years. Hopping head first into the hobby, he soon was able to find work on a game, and was hooked from there. With two games fully published under his name, one of them being "Heavy Metal Machines" (currently available on steam), and many other smaller projects, he is excited to craft the backbone of the Love Mythos experience. Although his day job might be working regularly with boring corporate software development, world building is his love. Whether it's terrain paging solutions in Unity for a 3D world rendering component, or playing with computer graphics, programming is often just as rewarding as it is stressful. His favorite character is whichever has the least amount of bug fixes in their chapters. Meet our Artist, a talent with an eye for backgrounds and mythological creature anatomy! Sandy Hong grew up in Northern Virginia, and quickly fell in love with animation. Whether it was captivating movies on the big screen, or goofy episodes on her television, Sandy ate it up. When told she needed to grow up, she did, and made her way to the Big Apple in 2005 to pursue her dream of studying animation at the School of Visual Arts. Probably not what the original speaker intended. After graduating in 2009, (and some solid convincing herself that her degree was not a waste), Sandy ended up at her dream job at Nickelodeon as a background designer. There she excelled and found her true talents in composition, creating breathtaking backdrops, and even won an audience choice award in a Film Race. With plenty of growth under her belt, Sandy left her Nickelodeon family and decided to focus on her passion for video games. She is now contributing as a freelance game artist assisting various indie game studios. After recently graduating from UC Davis with a B.S. in Evolution, Ecology, and Biodiversity, Steven decided to put his true passions to work, and joined the SquidSinSquad to create music for a unique and truly interesting addition to the Visual Novel genre. Steven has interests in most genres of music, and has been influenced by various artists and composers, including: Nujabes, Shoji Meguro, Takeharu Ishimoto, Yasunori Mitsuda and Nobuo Uematsu. 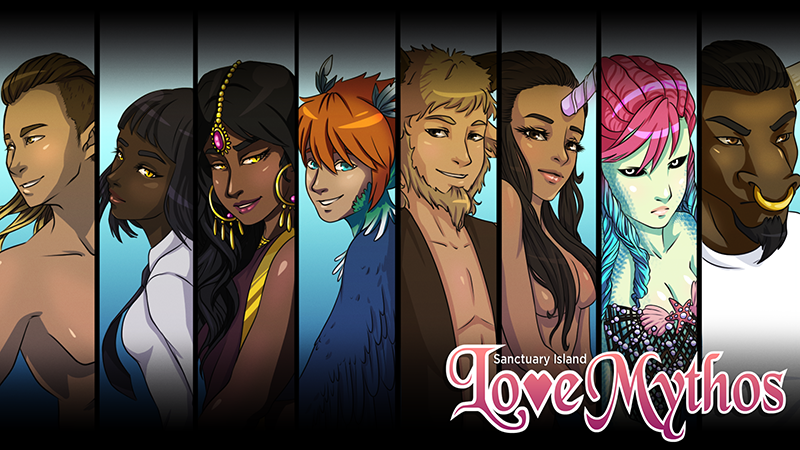 Steven has incorporated his most keen interests into the sound and music of LoveMythos in the hopes of giving it a fun and inviting audio aesthetic that compliments the mood and cadence of the story. When he's not writing "dulcet tones" for games, Steven is often lost in the dense haze of an anime and/or video game bender that can last anywhere from hours to the rest of his adult life.